The first Grade 1 of the Japanese year is the February Stakes run at Tokyo on Sunday. Copano Rickey won the race twice recently. Will the February Stakes (1600m) at Tokyo on Sunday be dominated by just the dirt trackers? The February Stakes is a Grade 1 race run under Weight For Age conditions for four year olds and above at Tokyo racecourse conducted by the Japan Racing Association. The February Stakes is run over 1600m. It is run on the dirt. It was first run in 1984 and was won by Robaria Amon. Originally a Domestic Grade 3 race, it was elevated to Domestic Grade 2 in 1994 then Domestic Grade 1 in 1997 and now at its present level in 2007. Horses from the National Association of Racing (NAR) have been eligible to run in the race since 1995 and from 2007 for horses not trained in Japan. This race and the Champions Cup in December are the only Grade 1 dirt race organized by the JRA (the other international Grade 1 dirt race (Tokyo Diashoten) and domestic Grade1 races are all organized by NAR). It is considered as a progression for the dirt races conducted on Dubai World Cup night in March. The February Stakes is worth JPY216,000,000 in 2019 (approx. AUD2.7million). Tokyo racecourse is a left handed course with the mile start in the back straight. The 2003 February Stakes was run at Nakayama over 1800m. The only multiple winner of the race is Copano Rickey in 2014 & 2015. No one age group has dominated but the five year olds have won it most with 14 times. The most successful jockey is Yutaka Take who has four wins. Akira Murayama has won the February Stakes three times since 2012.
Notable winners of the February Stakes include Gold Dream (2017), Copano Rickey (2014/2015), Transcend (2011), Espoir City (2010), Success Broken (2009), Vermillion (2008) and Agnes Digital (2002). 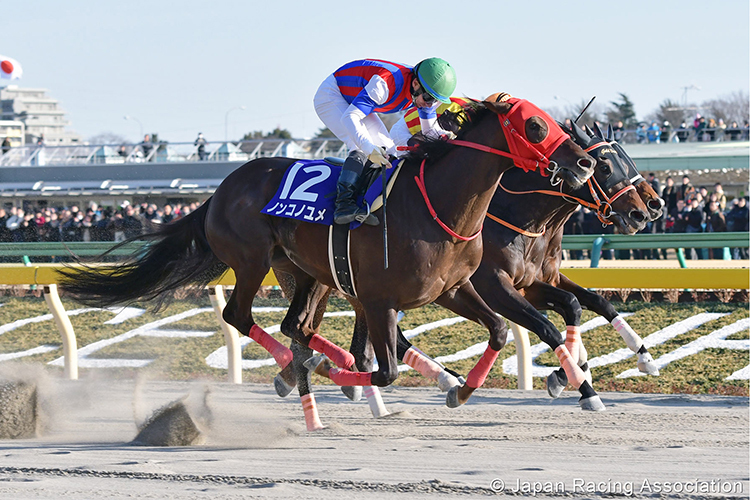 The 2018 February Stakes was won by Nonkono Yume from Gold Dream and Incantation.